Our market has loved one decision that the Indian government took, bringing out a segment of tax benefited sub four meter car. Manufacturer creative heads have churned out even more ambitious plans to exploit this situation. Long wheelbase sedans such as the Tata Indigo XL was a great car. Then came more sedans but with shorter wheelbase. Then came SUV’s in the sub four meter space. Ford Ecosport started it. Americans were quick to get this to the Indian market in 2012. Got the formula right, despite that they flunked the rules and plonked a bigger engine which was above 1.2 litre and gave it to the enthusiast. It took care of all the needs. High on safety, features, dynamics and performance. Many compact SUV’s came along. Recently, Mahindra finally responded directly to all of them and we decided to pitch it directly against the segment leader, not in numbers, but critically, the Ford Ecosport. Both are strikingly similar on paper when it comes the offering. We pit them after driving the diesel variants. Styling of both of them are chalk and cheese, surprisingly. Tata pulled of the Indigo XL, Mahindra pulled of the XUV 300. A longer wheelbase and wider footprint means the XUV 300 comes close to the Hyundai Creta and is far more bigger than the Ecosport. The Ford Ecosport passes of as an muscular and stubby car in comparison. Both SUV’s though of 17-inch alloy wheels on offer which give them great stance. The Ecosport design has changed with the facelift and looks more bold. Rear remains the same which is not high on elements but does the job thanks to a spare wheel mounted, giving it the more ‘authentic SUV’ feel. XUV 300 feels chopped of but the tail gate and tail-lamps helps it stand out to a very large extent. The front of the Mahindra is more traditional and appealing with a typical grille and large headlamps and an unique LED DRL setup. Overall, both look great, but the XUV 300 commands more footprint on the road despite its shape is very similar to the Maruti Brezza, it does grab attention. Interior of the Ecosport is all black while Mahindra has lighter, off-white color and with dual tone layout to make it more richer and airy. When it comes to knee, leg and shoulder room, Ecosport falls short and XUV 300 has a lot of it. Headroom is good in both SUV’s. The quality of materials in the XUV feels a bit better than the Ford Ecosport too. XUV 300 has buttons are brushed aluminium finished add more luxury quotient to the SUV. We found the build of the XUV 300 a bit less impressive when compared to the solidly built interior of the Ecosport, which also has been proven over time. Both have intuitive touch screens to use. A/C controls are simpler and basic in Ecosport. However, the XUV 300 has a larger layout for the same but that ends up looking quite dated. Boot space is another highlight as the XUV 300 doesn’t not excel while the Ecosport does as the difference is 100 litres of more available space in the Ecosport. 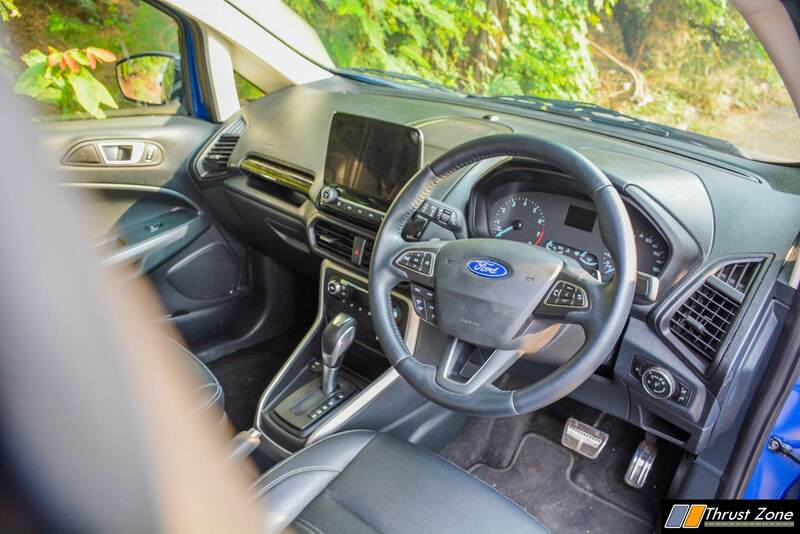 Feature list includes, Dual-Zone Fully Automatic Temperature Control(Ecosport doesn’t), Steering modes (Ecosport doesn’t), Supervision Cluster with 8.89 cm TFT Screen, Central Locking, Key with Remote, Passive Keyless Entry, Push Button Start/ Stop, 17.78 cm Touch Screen Infotainment, Monochrome Infotainment Display, Bluetooth/ AUX/ USB Connectivity, In-built GPS Navigation (Ecosport doesn’t), Android AutoTM & Apple CarPlay*, Smart Watch Connectivity (Ecosport doesn’t), Front Parking Sensors	(Ecosport doesn’t), Rear Parking Sensors and Rear Camera with Adaptive Guidelines. List also includes Projector Headlamps, Electrically Adjustable ORVMs, Driver Power Window with Express Down, Instrument Cluster with Multi-colour Illumination (Ecosport doesn’t), Bluesense App(Ecosport has SYNC 3 and Emergency Assist), Follow-me-home & Lead-me Lamps, Automatic wipers and headlights, Micro Hybrid Technology (Ecosport doesn’t), Tyre-position Display (Ecosport doesn’t), 1-touch Lane Change Indicator, Voice Commands & SIVIS Read Out, Tyre-tronics and Auto-dimming IRVM. Leather Steering & Gear Lever Knob, Steering Mounted Phone & Audio Controls, Cruise Control, 60:40 Split 2nd Row, Height-adjustable Driver Seat, Height-adjustable Front Seat Belts (Ecosport doesn’t), Electric Tailgate Release (Ecosport doesn’t), Adjustable Headrest for All Seats in 2nd Row, Premium Leatherette Seats, Electric Sunroof with Anti-pinch and Bungee Strap for Stowage (Ecosport doesn’t). We had the diesel for test and the numbers game is quite interesting. 100 PS and 205 Nm of torque in the Ford Ecosport with a 5-speed gearbox and the SUV weighs 1305 kgs. The XUV 300 has 115 PS of power and 300 Nm of torque mated to an 6-speed gearbox in a car which weighs 1400 kgs. Ecosport weighs 1300 kgs. Both SUV’s offer excellent driveability in the city. THE XUV 300 delivers 14 km/l while the Ecosport delivers 17 km/l. XUV 300 does 0-100 km/hr in 12 seconds while the Ecosport does it in 13 seconds. Mid-range and top-end though is superior on the XUV 300 as it has a higher top speed over the Ecosport thanks to taller gearing in the XUV 300. Both SUV’s have good NVH level despite high powered diesel motors. Clutch is light and gearbox are smooth in both SUV’s. The XUV 300 engine feels more relaxed while the Ecosport with its neutral gearing and a 5-speed gearbox means its eager, but controlled to be driven sedately at the same time. Dynamically, both cars have 17-inch wheels and FWD layout. The steering modes on the XUV 300 make it sportier because the feedback and heavy-ness is a bit more apparent. The Ecosport steering is also precise, has feedback and weighs up well on the highway. XUV 300 has an edge here when it comes to braking as it has four wheel disc brakes which give a better stopping power despite pedal bite in the XUV 300 isn’t supremely sharp, which is seen in the Ecosport despite drum setup which means Ecosport offers good stopping power as well. Body roll in both cars is well controlled, but XUV 300 displays a bit more. More weight, more wheelbase means its not chuckable as the Ecosport which feels nimble in comparison to a large extent. Stability in both cars is good, but the XUV 300 can feel a bit flighty, you need to check air pressure accordingly in the XUV 300. While the battle of these two giants in the sub compact SUV space seems complicated, choosing one is now more simpler for you, right? The XUV 300 has a bit more feature, space and footprint on the road and asking price is just Rs. 10k more OTR over the Ecosport in Mumbai. Rs. 14.35 lakhs Ford Ecosport vs the XUV 300 costing Rs. 14.44 lakhs. That is a lot of money for an compact SUV. Variant by variant too, the XUV 300 is more simpler, but the Ecosport offers you more leverage to choose the right variant as there many options. You can choose either of them and not go wrong. However, if you want more of everything, be it space and features, the XUV 300 is the SUV for you. For everything else, the Ecosport is still a good option. 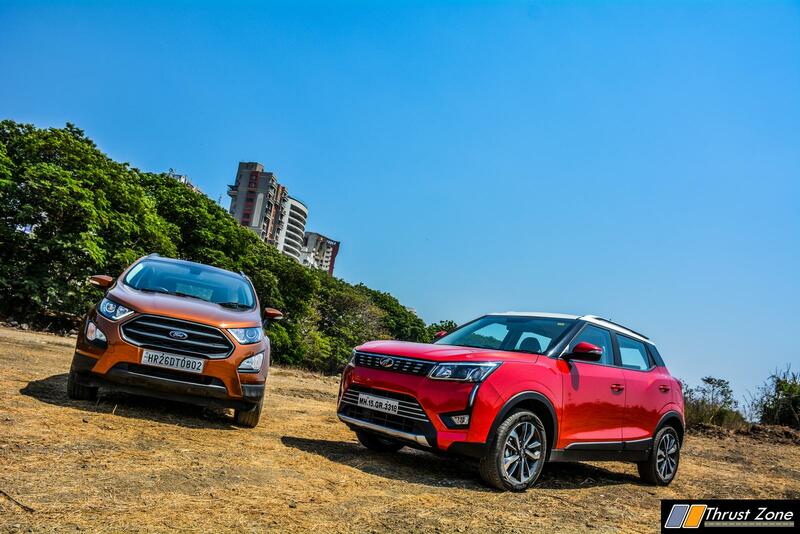 As a better SUV’s of the two, the XUV 300 wins the test because it takes on a segment above by a small margin too. MG Hector Infotainment System Revealed – Tesla Like Screen To Be On Offer! Applying For Car Loan Simplified – Handful Of Processes And You Get Your New Car!